Turn the oven on 'broil'. In a small frying pan, pour 2 Tbsp. of the olive oil and heat on 'low' for just a few seconds so that you do not burn the olive oil. Add the chopped onion and cook until soft, about 2 to 3 minutes. While the onion sautes, beat the eggs in a medium-sized bowl, and set aside while the veggies cook on the stove. Add the chopped tomato to the onions in the frying pan (not the eggs), turn up the heat of the stove, and cook until most of the liquid is reduced (too much liquid will lead to very runny frittatas that are undercooked and mushy). Add the basil to the onion/tomato mixture in the frying pan. Remove pan from heat and add all of this cooked veggie/herb mixture to the bowl of beaten eggs. Add another Tbsp or two of olive oil to the pan. Pour the egg/veggie/herb/parmesan mixture back into the pan, cover, and cook on LOW for 20 minutes or until the egg mixture is cooked. 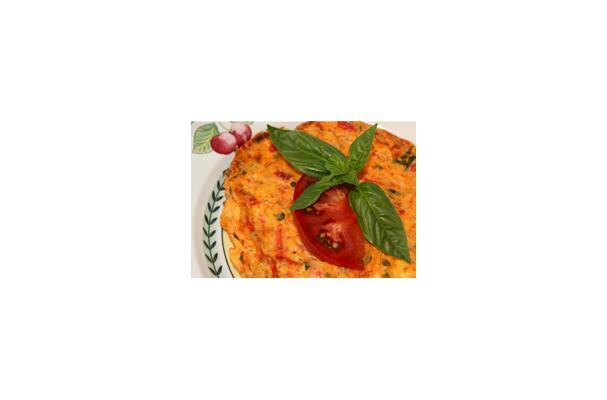 Place the frying pan with frittata in the oven and broil until the frittata is cooked through and golden brown. Keep your eyes on it so that it doesn't burn. With a good oven mitt/glove, take the frittata out of the oven. If you like, sprinkle with some freshly grated Parmesan cheese. Garnish with pretty tomatoes and sprigs of fresh basil.